Pancreatic cancer is an especially aggressive cancer with a high mortality rate – only 6% of those affected survive beyond 5 years. It is also the fourth most common death from cancer worldwide. Even under conditions when it was supposedly caught early on, the adenocarcinoma was successfully resected and the liver was deemed to be free of the presence of metastatic legions, patients, nonetheless suffered from subsequent metastatic disease. The obvious conclusion from this observation is that there are latent metastases that persist and that are only detectable microscopically. Furthermore, these latent metastases were believed to represent a balance between cancer cell growth and cancer cell death precipitated by the participation of the immune system in countering this growth. More recent evidence has indicated, however, that quiescent single disseminated cancer cells (DCCs) are involved. 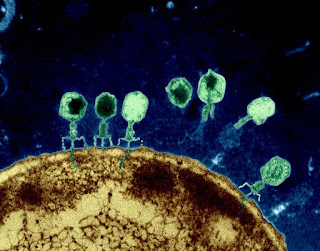 An explanation for this quiescence has been elusive: although involvement of the immune system is suspected. Of course, the question remains that if the immune system is involved why is it not able to eliminate these DCCs entirely. Douglas T. Fearon and his colleagues from the John Hopkins University School of Medicine studied the role of adaptive immunity in response to DCCs using the mouse model. Both mice and humans with pancreatic duct adenocarcinoma (PDA) show DCCs resident in liver. in both cases, these cells display unusual phenotypic characteristics – negative for cytokeratin (CK) 19 and major histocompatibility complex class I (MHCI). 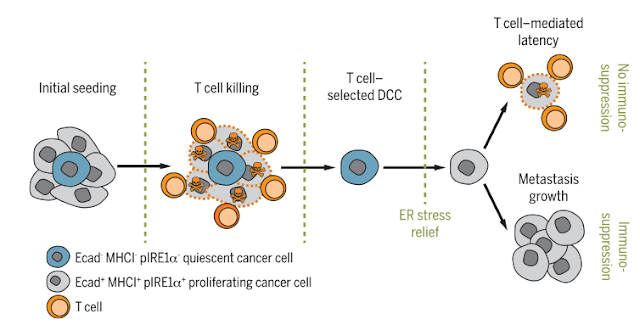 According to the authors, “The absence of MHCI and the occurrence of specific CD8+ T cells in the genetically engineered mouse model of PDA, and possible in patients with PDA, suggested that DCCs may be selected by an anticancer immune response during the metastatic process.” This rationale is represented by the image below. The lack of the expression of MHCI in DCCs is indicative of Endoplasmic Reticulum (ER) stress. ER stress occurs within cells in certain pathological conditions when there is an accumulation of unfolded proteins. Many proteins vital to cell viability are maintained in precise folded configurations. If the mechanism responsible for maintaining proteins in the folded state is disrupted, this results in so-called ER stress. In this model, quiescent DCCs lacking the expression of MHCI elude destruction by the CD8+ T cells. These surviving DCCs can then grow out into full blown metastases if the immune response is subsequently disrupted. In other words, it is the immune response that selects for quiescent DCCs. To test this hypothesis, the investigators used a mouse model that would allow them to introduce immunogenic PDA cells into seeded mice livers that were pre-immunized and contained only quiescent DCCs lacking MHC1 and CK19. Those recipients that were not pre-immunized developed macro-metastases. As a result, a subpopulation of PDA with the phenotypic characteristics of DCCs were found in vitro and those cells proved to be the precursors of DCCs in vivo. This finding may prove important in developing more effect therapeutic strategies for combating pancreatic cancer that currently has an unacceptably high mortality rate.